Batch mixer emulsifies, homogenises, solubilises, suspends, disperses and disintegrates solids. Each mixer, with its precision-engineer rotor stator workhead, far outperforms conventional mixers, cutting processing times by up to 90%, improving quality, product consistency and process efficiency. High Shear Batch Mixers will process from 4 to 30,000 litres, eliminate agglomerates and fish eyes, create stable emulsions and suspensions, reduce particle size, rapidly dissolve solids, accelerate reactions. 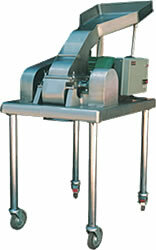 A High Speed Mixer / High Speed Blender are single shaft mixer used to blend ingredients requiring moderate shear. The blade imparts some shear forces to the ingredients, but also blends due to the pumping action of the high vane design. Through proper blade selection and sizing, a substantial flow can be established that will repeatedly turn over the batch and yield a homogeneous product. High Speed Mixer is most often used for let down or thin down of pre-dispersed products into liquids. Mass Mixer has been well designed to facilitate through Mixing of dror damp materials and is especially suitable for tablet granulation. Mass Mixers are useful in Pharmaceutical, Chemical, Dyestuffs, Food & Beverages, and Automobile Industries. Mass Mixer is suitable for mixing wet and dry powders. The equipment consists of paddle like blades for efficient granulation and mixing of material and is provided with leak proof seal tilting arrangement for ease of unloading the material. These blades are placed in a horizontal position and have a single speed rotation. Mass Mixer machines are provided with transparent poly-carbonate dust cover with inter locking system to view the raw material being mixed. This motor driven machine is also equipped with safety switch to automatically stop the mixer as soon as the cover id opened. The "V" type Blender is an efficient and versatile blending machine for mixing and lubrication process of dry powders homogeneously. Approximate two third of the volume of the Blender is filled to ensure proper mixing. The "V" Blender gives best result for powders due to suitable medium speed and "V" shape of container. V type Mixer can be used for Pharmaceutical, Food, Chemical and Cosmetic industries. "V" Blender the powders comes from all sides due to the "V" shape of the product container, hence requirement of RPM is medium. V Type Mixer is suitable mainly for powder & granules type material. This type of material gets sufficient continuous movement. Due to the "V" shape of container, even medium movement will result in good quality of blending/lubrication of granules. V Type Blender is easy for loading and unloading, easy for cleaning. The "V" shape gives sufficient continuous movement to the granules, result in good quality. In Communiting Mill most of the work is carried out impact-in-air, screens with large holes can be used in Communiting chamber with a corresponding increase in output. Variety combinations of speed, aperture size and type of blades contribute towards its flexibility. Unit consists of hopper, feed throat and processing chamber with beaters assembly, heavy duty motor, starter with overload relay, three speed step pulley, suitable screen, SS cladded base having tabular legs with castors, optional jacket for the feed throat and processing chamber for cooling / heating. This ensures that material is presented to the rotating blades at the correct angle. The Communiting Mill is having the knife edges for Granulating, Chopping, Cutting and sizing. It also having impact edges is for grinding, pulverizing, blending and mixing. The size of the aperture merely determines the size of particles that final product may contain. Communiting Mill is used for wet and dry granulation, pulverization or dispersion of products or ingredients found in the Pharmaceutical, Chemical and Food Industries. Communiting Mill is also find application in the Cosmetics, Confectionery, Fertilizer, Insecticides, Detergents and Electroflux Industries etc. High speed for grinding, low speed for coarser particles. A wide range of screens is available for various process needs.